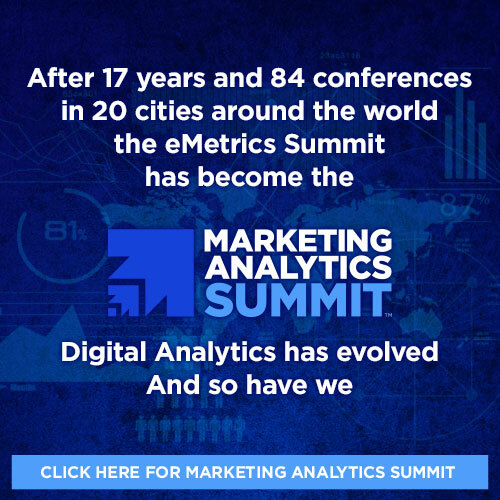 While other eMetrics tracks get functional, this track looks at your corporate analytics strategy: Understanding modeling and attribution, optimizing your optimization program, protecting customer privacy and mastering the art of meaningful scorecards and dashboards. You’ll also explore insights about career path options, hiring guidance and how to communicate insights better so you are more influential. While it’s easy to put out a shingle and claim you’re “excellent” at analytics, standing up a “Center of Excellence” that can deliver a company-wide capability for analytics at any scale is no small task. It requires careful planning, diligent process and ongoing governance and missteps in the process can result in data distrust and actually stop organizations from becoming data driven. John explores the critical components of building and sustaining a solid digital analytics program to ensure that a Center of Excellence is truly excellent. A veteran consultant and longtime industry analyst, John draws on his extensive experience to reveal secrets and best practices that apply to anybody facing this challenge. In all the excitement around Big Data and Analytics, even savvy users of business intelligence can get a bit confused about how and when to use A/B Testing, Predictive Analytics, and Personalization to optimize. But optimizing isn’t about choosing which tool to use: Optimizing is about making decisions. Matt discusses how to bring these tools together to make better decisions, and touches on how machine learning can help automate the process. Advertisers are collecting as much data as possible in order to sell finely targeted audiences to corporations. Privacy advocates are trying to wake up the populace to the continuous loss of civil liberties. Marketers are just trying to use the best tools to sell more stuff without alienating the public. Aurélie offers up a global view privacy rules and regulations to highlight how the upcoming European Union Personal Data Protection Regulation will influence digital analytics around the world. Then David identifies key data collection and usage issues and discusses ways to obtain the data we need while maintaining the trust and confidence of those we need to reach. We’re all publishers now. But how do you measure the return on your investment in content? What metrics help brands create more, better content? What outcomes are the most indicative of high quality content? Virality without sentiment analysis and views without brand association are not winners, worthy of imitation. Fred delineates the methods and the metrics of content optimization that aid in performance measurement, budget allocation and agency selection. You’ve invested in collecting data, built numerous marketing models, established an analytics team, even developed a data governance process, but one of the biggest challenges for many marketers is how to translate the value of the data and associated insights into something meaningful to the C-Suite. According to the 12th annual Forrester/ITSMA/VEM study less than 10% of the C-Suite uses the data provided by marketing to make strategic decisions. Laura shares best-practices and practical tips on how to make Marketing and the Data more relevant to the C-Suite. Pitfalls traps, blood, sweat and tears. Barry covers People: from the web analytics pyramid to using color code personality science – yes, it’s an art form. Barry covers Processes: from endless discussions about attribution models to getting the basics right first. Barry covers Technology: from server side tag management to debugging mobile. Learn from his years in the trenches getting the terminology right, the three magic buttons of managing stakeholders, the lack of automated insight and how he got £1.7m in 7 minutes from the Tesco board. Plus a load of other stories. Brooks Bell, Founder & CEO, Brooks Bell Inc.
Getting the work done well requires a roadmap. Whether you are trying to improve your hiring practices, your testing methods, your analytics maturity or getting your entire organization to embrace digital analytics for brand growth, these three cartographers outline the path from the seas of uncertainty, through the swamps of setbacks, up the slopes of hope to the pinnacle of best practices. Bring your own compass. A great strategy is defined by complimentary choices. Netflix, Amazon, and LinkedIn have great personalization strategies. What can you use to compete? Participants can expect to learn more about the choices available, viable, the stances attempted (customer centric, business centric, arbitrage centric), the tools available in the ecosystem (Mahout, various API’s), and the experiences those tools created.